Brahmagupta was an Ancient Indian astronomer and mathematician who lived from 597 AD to 668 AD. He was born in the city of Bhinmal in Northwest India. His father, whose name was Jisnugupta, was an astrologer. Although Brahmagupta thought of himself as an astronomer who did some mathematics, he is now mainly remembered for his contributions to mathematics. Many of his important discoveries were written as poetry rather than as mathematical equations! Nevertheless, truth is truth, regardless of how it may be written. • was the director of the astronomical observatory of Ujjain, the center of Ancient Indian mathematical astronomy. • said solving mathematical problems was something he did for pleasure. • was the first person in history to define the properties of the number zero. Identifying zero as a number whose properties needed to be defined was vital for the future of mathematics and science. • defined zero as the number you get when you subtract a number from itself. • said that zero divided by any other number is zero. • was the first person to discover the formula for solving quadratic equations. • wrote that pi, the ratio of a circle’s circumference to its diameter, could usually be taken to be 3, but if accuracy were needed, then the square-root of 10 (this equals 3.162…) should be used. This is about 0.66 percent higher than the true value of pi. • incorrectly said that Earth did not spin and that Earth does not orbit the sun. This, however, may have been for reasons of self-preservation. Opposing the Brahmins’ religious myths of the time would have been dangerous. • produced a formula to find the area of any four-sided shape whose corners touch the inside of a circle. This actually simplifies to Heron’s formula for triangles. • said the length of a year is 365 days 6 hours 12 minutes 9 seconds. • calculated that Earth is a sphere of circumference around 36,000 km (22,500 miles). • adding two negative numbers together always results in a negative number. • subtracting a negative number from a positive number is the same as adding the two numbers. • multiplying two negative numbers together is the same as multiplying two positive numbers. • dividing a positive number by a negative, or a negative number by a positive results in a negative number. Although it may seem obvious to us now that zero is a number, and obvious that we can produce it by subtracting a number from itself, and that dividing zero by a non-zero number gives an answer of zero, these results are not actually obvious. The brilliant mathematicians of Ancient Greece, so far ahead of their time in many ways, had not been able to make this breakthrough. Neither had anyone else, until Brahmagupta came along! It was a huge conceptual leap to see that zero is a number in its own right. Once this leap had been made, mathematics and science could make progress that would otherwise have been impossible. Scientists at the University of Oxford have established that an Indian manuscript dated 200-400 AD is the first documented use of zero, as shown in the video below. 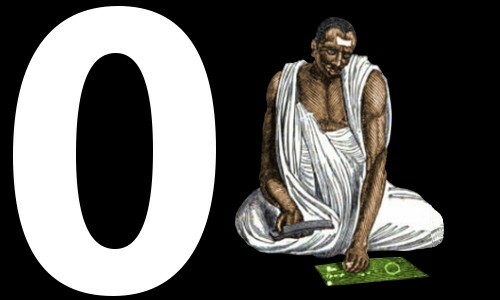 Zero was invented before Brahmagupta’s era! "Brahmagupta." Famous Scientists. famousscientists.org. 07 Jul. 2014. Web.